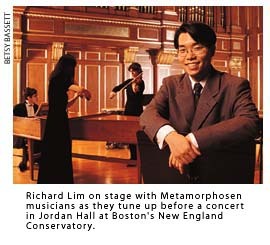 In 1993, Richard J. Lim (HBS '98), a violinist with a degree in economics and East Asian studies from Harvard College, cofounded the Metamorphosen Chamber Orchestra, a critically acclaimed thirty-member chamber orchestra based in Boston. In just its third concert season, the orchestra is already two years ahead of Executive Director Lim's business plan projections and is proof that pleasure mixed with business can indeed lead to personal harmony. A second-generation Korean-American, Lim grew up in a musical family in upstate New York. In college, he was elected the Harvard student orchestra's tour director and led the group on a highly successful 1992 European concert tour. Returning to Cambridge, Lim and his classmate, first violinist Scott Y. Yoo (Harvard '93), conceived the idea of starting an orchestra, with 18- to 25-year-olds as their target audience. After a year of planning, with Yoo hiring topflight young musicians and Lim handling the business end, Metamorphosen came to life with a startup budget of $75,000 raised from charitable donations (the orchestra is a tax-exempt entity), corporate sponsors, program advertising, and ticket sales. The orchestra debuted to rave reviews at Boston's Jordan Hall in October 1993 with Yoo, now a professional musician, conducting. Explains Lim, "Our musical goals include the execution of first-rate performances, the introduction of new music, and a fresh approach to music presentation." An innovative repertoire - incorporating new music as well as traditional classical music - combined with an audience-friendly format have been keys to Metamorphosen's success: concerts include commentary about a work's important themes and passages, the composer's frame of mind and sources of inspiration, and other background. "The commentaries help demystify modern music and make it more palatable to audiences," Lim says. Lim sees his pre-HBS experience as a business consultant as invaluable in Metamorphosen's startup and operation; his corporate-world acumen plays well in the music realm, he says, because marketing and finance skills are also essential to nonprofit ventures. His consulting background has also provided him with the business savvy and expertise to which potential backers (including several HBS alumni) particularly respond. As for his future, Lim says, "This marriage of my corporate and music lives is deeply fulfilling; I plan to continue accordingly." For Lim, then, Metamorphosen's success is likely just the first movement in what promises to be a bravura career performance.